These are the first pieces of my new art jewelry collection fresh out of the studio! Though The Day of the Dead is celebrated in autumn, I have designed these pieces to be worn anytime throughout the year. Bohemian, tribal and rock styles have influenced the look of this unique collection! Each piece in this collection is uniquely designed and individually handmade. They have been lovingly handcrafted with special attention to artisanal details, such as wire-wrapping, hand-knotting, natural gemstones, handmade beads, and rich material textures. (See my handmade polymer clay sugar skull bead collection in production.) Every design is original and exclusive to Elysian Studios. Each piece is one of a kind. Art Jewelry Shop at www.elysianstudiosart.com. Elysian Art A La Carte Shop. Consider adding a new accessory to your wardrobe this autumn. These one of a kind, colorful statement pieces are sure to add a feminine bohemian, yet edgy rock vibe to your look! What a fun series! Love the yellow leaf details in the necklace and those fringy, feather earrings are my favorites! 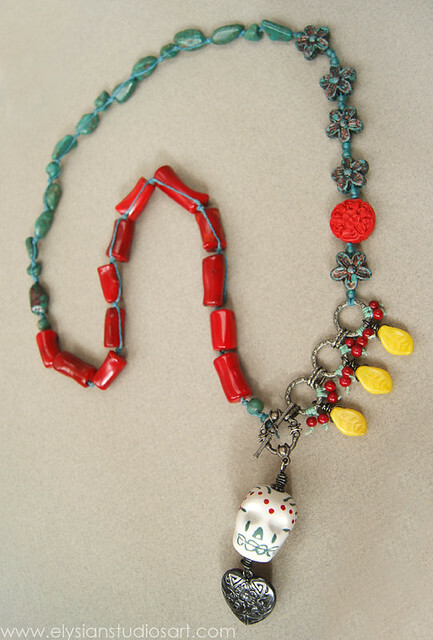 Your gypsy trade beads go so well with the Sugar Skulls...more! More! This is such a whimsical collection, Erin. Great play of colours and textures! Oh thank you so much for those nice compliments! I really appreciate them, ladies! Oh my! Those jewelries are really cool. And I guess those jewelries would be a perfect way to complete a Halloween-inspired outfits. They are really cute.